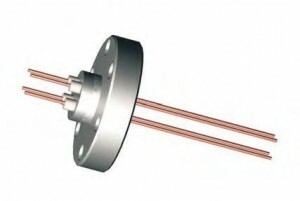 Vacuum Feedthrough for UHV and high vacuum to 1000V. Electrical feedthroughs used for the transmission of high voltages and/or high current into vacuum systems. Power feedthrough options provide voltages from 500V-1000V with amperages to 25 amps per pin. High purity alumina ceramic insulators provide electrical isolation and various conductor materials offer specific current capacities.